Today was a pretty good day! Kind of slow to start off with. Jacob slept in until 10:00 again. He doesn’t get much sleep at night, so he’s not up real early in the morning. He sure didn’t want to get up and get moving this morning, but Rhys (the childlife specialist) coaxed him into getting up to go to the playroom. Before they headed down there, they had to stop by the nurses station to get permission from Jacob’s nurse. Jacob was telling them that his Aunt Rachel bought him some scar tattoos for his head (which he hasn’t used yet). Rhys told him that he could put one on with a Sharpie. Jacob did not like the sound of that, so Rhys said he’d give one to the nurse instead. 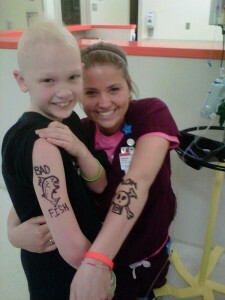 He grabbed the nurses arm and a Sharpie and drew a skull and crossbones tattoo with MOM on it. Quite funny! Then begged Jacob to tattoo his arm. 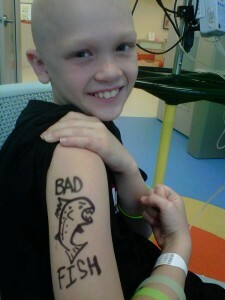 Jacob finally gave in and Rhys gave him a fish with BAD FISH written on his arm. At least it was his upper arm, so it can be covered up with his sleeve. 🙂 The nurse and Jacob decided that it was only fair that they should be able to give him a tattoo, so they made a butterfly on his arm. Ha! Rarely a dull moment here. I’ve posted pictures below. After lunch, Jacob had physical therapy for an hour. He did pretty good. ThePhysical Therapist had him doing a lot of standing on one leg. That was certainly a challenge for him, but he did good. He was really tired out by the end since it’s half way through the week of chemo. We got back down to his room at 2:00, just in time for him to start another round of chemo. 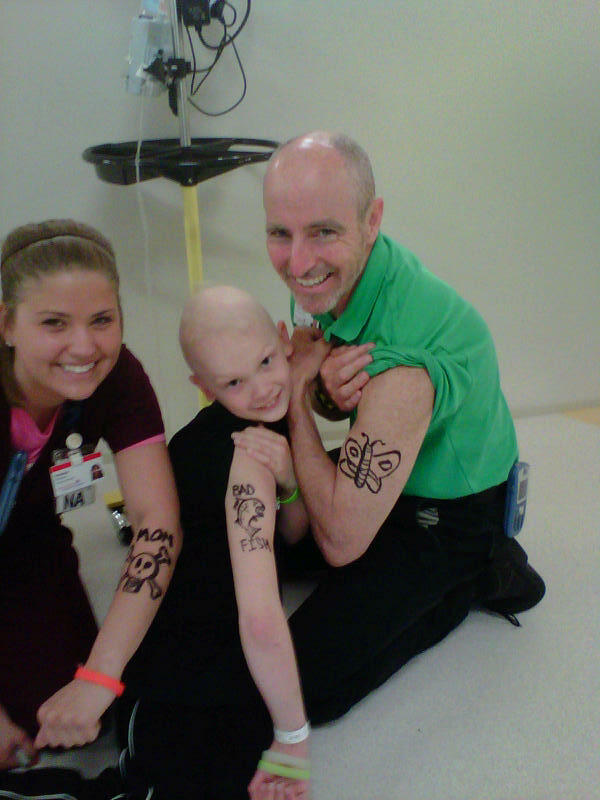 In case you’re wondering or if you care, this whole week (every 5 day stay), Jacob gets Ifosfamide and Etoposide each day. They take about an hour each to administer. At 3:00, my sister Rachel, her son Jayden, Caleb, my sister Liz and her daughter Brooke came for a visit. I was so happy they came. It’s so nice to have company while we’re stuck in the hospital. The visit is never long enough. After dinner, we just relaxed and watched movies. Tomorrow Jacob will start chemo at 11:00. He’s doing so well with it and usually does with these drugs. It probably won’t hit him until tomorrow night or Friday with the nausea. Last time he didn’t get sick until we were leaving. Hopefully he’ll feel okay and the nausea will be minor. Please be praying for that! I know so many of you are praying for Jacob every day and we can’t thank you enough for that! I know it is helping him so much. Please don’t stop and keep praying for his healing and a speedy recovery. Also that he’ll continue to get stronger and stronger every day. Please keep Caleb in your prayers also. It is so hard for him to be away from us. I spent about a half hour on the phone with him tonight. He was crying and so upset because he missed me and wanted me to snuggle him. It’s heartbreaking!! I know things are worse at night time when you’re tired, but I pray that’ll he’ll have peace and comfort to get through the times I’m not there. Love the Bad Fish tattoo, how funny! We’re thinking and praying for all of you! Nice tattoo. I think Mom needs one also. Keep it going, Jacob! Bryan and I are rooting for you! He has beaten this and so will you! Awesome tat! Glad to see you smile in the pics. Oh yeah, nice fish. get better soon!ohyeah and hope thats not permanent!keep in touch!